A charming but sometimes frustrating toddler independence development has been the attachment to random objects. When we leave the house an assortment of odd accoutrements join us. Last week we went to Oma’s house with 2 golden books, Seal (the toy) and a measuring cup. When we went to the park a large Tupperware container and a small plastic bowl accompanied us. A rather large attachment has formed to pencils and crayon pens lately and those that haven’t been dropped down the hole in the floor (a knot of wood in the floorboards) join Bub for dinner, naps and car rides. 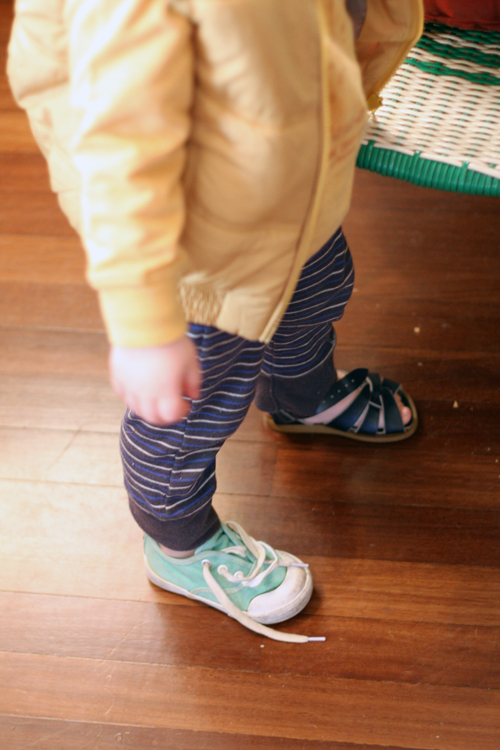 Shoes are also a subject of a lot of interest, this morning’s footwear was chosen and put on by Bub. He was very proud and would not listen to me when I suggested he have a matching pair, or perhaps wear socks for warmth. So I had to put a body warmer on him to keep out the chill as we play lego towers.